Clay Soils around Longmont – Glacier View Landscape and Design, Inc. 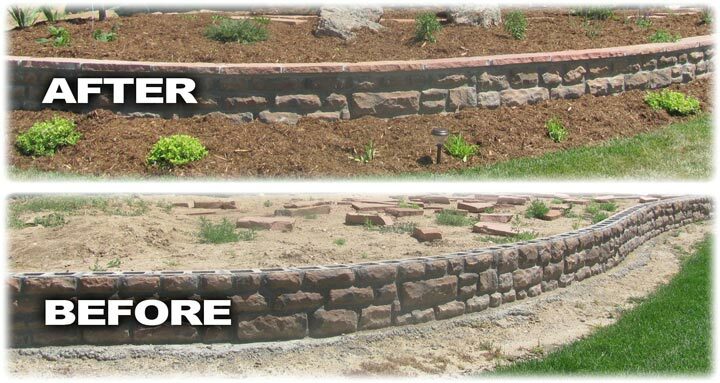 In this Longmont Colorado landscaper article, Dave White offers practical advice about the best methods to amend the clay soils all along the Front Range. Contact Dave now for more information. You know, I can’t even call the clay I work in most of the time “soil”. It is almost as bad as trying to plant in solid rock! Most people in Colorado who live outside of downtown Denver have a yard in a subdivision. At some point, they’ve tried to plant something in their yard and discovered either clay, sandy clay, or a few inches of topsoil followed by lots of broken rocks. How did all that get there and what can be done about it so that things can live? Actually, of all three soil types described, the one with the rock is probably the best of the three native soils to work with. Even though it is about the worst to dig a hole into, the rocks provide a space for air to exist within the soil. Roots need air to survive. In this short article, I’m going to explore the soil types along the Front Range of Colorado like for example in Longmont CO and what we as landscapers do to combat those soils so that the material we plant in them can thrive. THIS CLAY IS THE WORST! The recent history (last 20,000 years) of soil development along the Front Range plains of Colorado consists of wind-blown (Aeolian) loess, alluvial (re-deposited) soils and fluvial (river) transport of materials that was laid down on top of the sandstone, shale, and limestone deposits of the Late Cretaceous Inland Sea (a large body of water that extended from Canada to the Gulf of Mexico and Minnesota to the Rocky Mountains about 90 million years ago). This is a gross overgeneralization of the process but explains the thin “topsoil” that covers what we’ve all come to call “clay”. Soil is classified into horizons in undisturbed areas. The “O” horizon is the dark topsoil which contains decomposing plant matter and nutrients and exists from the surface down to approximately 50cm here in Colorado, but is highly variable (topsoil in Eastern Washington State can be up to 300 ft. deep!). Next in depth is “A” horizon soil which is mineralized soil mixed with decomposed organic material (dark color) that exists from 10 to 150cm in depth. It is dominated by weathered mineral matter but has sufficient organic material to have a darker color than lower horizons. Next is the “E” horizon which is dominated by leaching of clay, iron, and aluminum, which leaves behind residual minerals. It is lighter than the “A” horizon in color and is not present everywhere. Next is the “B” horizon which is characterized as the zone of accumulation of clay, and iron/aluminum compounds that were leached from the “E” horizon. Finally, there is also a “C” horizon which is best described as unweathered bedrock rubble. Some of the very dense clay soil horizons are called “bentonite” and are what builders and developers refer to as “expansive soils” that can wreak havoc on foundation walls and floors due to the way they expand when wet. This article will not address the various geochemical compositions of soil types in Colorado, or what those compositions mean to various plant types, nor the mechanical properties of the soils. It will, however, give practical advice about the best methods to amend the clay soils in order to get plants and grasses to thrive. Almost all soils on the plains of Colorado that have not been disturbed, except those perhaps in flood prone areas, need to be amended to some degree before planting. Here is why. When a subdivision is created, the “O” horizon of soil is first removed by the developer and either sold as topsoil or worked into the existing “A”, “E”, “B”, and “C” horizons as the subdivision topography is sculpted. This is the process that occurs when one sees large earth movers making roads and huge dirt piles on what was once farmland. So, the nutrient rich “O” horizon is gone and the other horizons are homogenized into one soil type, generically called clay. Then the foundations for homes are dug, roads paved, sidewalks installed, driveways poured, and then final construction grading with heavy machinery around the homes. The soil becomes extremely compacted. Therefore, planting in the sub “O” horizons is futile at best. The remaining soil has a huge water holding capacity and is like concrete when completely dry. Some customers ask if soil testing is needed. The short answer is “never” unless an issue arises whereby one could not account for plant failure due to not amending the clay soils before planting. In that case, then perhaps a soil test is warranted to exclude the possibility that soil contamination from petrochemicals (a gas or oil leak from a vehicle during subdivision creation) or construction debris (usually a pile of drywall buried on a construction site) is to blame. What competent landscapers in Colorado find is that the more amended soil imported to the jobsite, the better. This is a generalization, however. Glacier View Landscape & Design, Inc. follows some simple rules about amending soil. For lawns that are to be sodded or seeded with either a Kentucky Bluegrass or Fescue/Bluegrass hybrid mixture, rototilling 8 inches to 12 inches into the existing clay of 4 or more cubic yards of “planter’s mix/compost blend” per 1000 sq. ft. of area is the first line of preparation. Planter’s mix is usually about 70% topsoil (“O” horizon soil), 20% composted manure, and 10% organics, usually wood chips or straw. Glacier View likes to add about 20% more horse manure compost to our mixture. Clay can be amended with sand to provide drainage, but a mixture of 80% sand to clay is required or else adobe will be created (a concrete like material used in adobe home construction). This is usually not feasible and is generally excluded as a viable option. After edging and irrigation are installed, the final grade consists of at least 3 cubic yards of straight planter’s mix per 1000 sq. ft. (this equates to about 1” depth). This gives the new sod its initial “punch” of nutrients so that the new roots can penetrate deeply into the tilled and amended sub-surface soil. This mixture of clay and amendments to about 12” depth now provides the newly formed “O” horizon. It is quite good at moisture retention due to the existence of the clay, but has the air and nutrients needed for root growth as well. Trees, shrubs, and perennials also need to have soil amendments added when planting in Colorado. When Glacier View Landscape & Design, Inc. is preparing a complete yard for turfgrass, tree, shrub, and perennial planting, along with hardscape products, we end up tilling soil into most areas of the property. If individual trees and shrubs are being planted, a good planter’s mix/compost blend soil is added to the clay that is removed from the plant holes. This clay then either gets removed from the site or redistributed during the course of grading. Pure planter’s mix soil should not be substituted for the clay that is removed from the hole, otherwise the “bathtub effect” ensues whereby the hole becomes a bathtub which holds water and can drown the tree. Instead, a mixture of the clay that comes from the hole is added to the pure planter’s mix and then the tree is planted in that mixture. This helps minimize the “bathtub effect”. If this process is not followed, plant roots will not strive to penetrate into the “clay only” area of the property since they are all but too happy to remain in the pure planter’s mix section. Those trees end up toppling in high winds due to poor root growth habits. Trees and shrubs planted correctly eventually end up with their roots penetrating into the nutrient-poor clay soils anyway, so care to select plant material that can tolerate clay soils is still important. The ideal planting site would have 6 feet of pure planter’s mix, but for most customers that scenario is cost prohibitive. Basically, the more we can stir up the clay and amend with good soil on the property, the better. This is why it is very rare for Glacier View to use heavy equipment for grading purposes. We almost always grade by hand and plant by hand. Our goal is to rototill and break up the clay soils as best we can without compacting them again with machinery. And finally, it is important to remember that it is easy to overwater clay soils amended with planter’s mix. When water is applied to properties that have not had the clay amended, the water usually penetrates very little and mostly runs down the gutter. A good mixture of clay and amendments really can hold water quite well, so be sure to follow your professional landscaper’s advice on watering. The amounts delivered by the irrigation system have been calculated with exposure, plant requirements, soil composition, and mulching techniques in mind. The old adage says “You can pay me now, or pay me later” really applies here. You can pay your landscaper to install a lot of good quality amendments to the clay soil now and you will save money in the long run by using much less water, less fertilizer, replacing fewer trees, shrubs, and perennials, and having the best looking, brightest blooming property on the block. Contact Dave White for a free landscaping consultation for your Longmont, Colorado home or business.